Alfa-Bird has been identified as a success story by the European Commission. The "4th International Conference on BiofuelsStandards: Current Issues, Future Trends" will take place on November13-15, 2012, in Gaithersburg, MD, USA. This International Conference is being organized by the US National Institute of Standards and Technology (NIST), the Brazilian National Institute of Metrology, Quality and Technology (INMETRO) and the European Commission’s Directorate C (Renewables, Research and Innovation, Energy Efficiency). Biofuels are finding expanded utilization in ground transportation systems, and more recently in aviation systems. Biofuels are being produced from different feedstocks, using a wide range of processes. Documentary and measurement standards, and reference data on thermo physical and thermo chemical properties of biofuels, play a critical role in assuring consistency and quality of biofuels produced using different processes and feedstocks. Brazil, EU and the US are the three largest producers of biofuels; other countries where biofuel production and utilization is increasing are also expected to participate in this Conference. The Conference will provide an overview of the state-of-the-art on biofuels used in surface transportation, such as bioethanol, biodiesel, other biofuels and algal biofuels; it will also provide an overview of the more recent developments in utilization of biofuels in aviation, and specific issues and requirements for biofuels that are utilized in commercial and military applications. Documentary and measurement standards needed to facilitate trade and applications in new areas will be identified. Requirements that result from new regulations and applications in different parts of the globe will be discussed. Utilization of biofuels in developing economies will be reviewed, implications for sustainability will be discussed, and future trends that may lead to the need for new biofuels standards will be identified. For more information about the Conference, please click on http://nist.gov/mml/biofuels-standards.cfm . To present a paper a the conference, please contact a member of the program committee to establish the suitability of the topic for the conference. Use this submission form to provide a title, authors, and abstract not to exceed 250 words and email it to ICBS2012@nist.gov with "ICBS Presentation" in the subject line. The 4th meeting of the Alfa-Bird project will take place in Airbus's premises in Toulouse on June 13-14, 2012.
in Toulouse, on June 13-14, 2012. The Alfa-Bird consortium will organize its 4th Annual Meeting in Toulouse (France) on June 13-14, 2012. This meeting will aim at presenting the main results and conclusions of the Alfa-Bird project. The call for papers is open until May 4th, 2012. To register, please click here (deadline: May 11th, 2012). This Workshop is organised by the European Commission and the Biofuels FlightPath Core Team under the framework of the EU Biofuels FlightPath in Aviation. Biofuels FlightPath - Workshop on Upstream R&D and Innovation for Paraffinic Biofuels: Call for abstracts "Session on Lab-Direct: Innovation & Prospects"
The event 'Upstream R&D and Innovation' will take place on Monday 18 June in Milan as a Workshop of the 20th European Biomass Conference and Exhibition in Milan, Italy, 18-22 June 2012. This Conference is the main European event on biomass and bioenergy in Europe and it is customarily attended by participants from the industry and the scientific and research community. The Core Team decided that it will be the appropriate event to host a Workshop addressing upstream and innovative pathways and value chains for the conversion of sustainable biomass sources to paraffinic biofuels for use in aviation. The purpose of the Workshop is to discuss with key stakeholders the state of the art and recent advances by upstream research in new technology pathways and value chains for paraffinic biofuels. The organisers have scheduled an 80 minutes session in which they invite PhD students to make presentations of their work. It is foreseen that 10 students will be given each 8 minutes (3slides, maximum 5 minutes presentation followed by 1 or 2 questions). All presentations should address innovative technologies on converting biomass to paraffinic biofuels for use in the aviations sector. The session will be followed by a 20 minutes discussion and Q&A directed specifically to the 10 presentations. Please note that this session is dedicated to PhD students and young researchers and no professor or senior researcher will be allowed to give a presentation. Kyriakos.Maniatis@ec.europa.eu by Friday 8 June 2012 close of business.The abstracts may address topics beyond "Microbial Conversion" and "Thermochemical conversionof sugars, alcohols and pyrolysis oils" which are the two main topics ofthe Workshop so long as they focus on paraffinic biofuels for aviation. Following a successful meeting held on April 3, 2012 in Geneva, important observations and positive comments were received from the International Air Transport Association (IATA) regarding EU-VRi's economic modeling developed within the ALFA-BIRD project. The EU-VRi team presented its economic model for the implementation of alternative fuel in the aviation sector to the International Air Transport Association (IATA) at a meeting held on April 3, 2012 in Geneva. Positive comments made by IATA during the presentation support the work developed and encourage further extension of the economic modeling within the ALFA-BIRD project. The 2nd European Algae Biomass Summit will take place in London on the 25th-26th April 2012. The 2012 European Algae Biomass Conference will include opportunities to hear from leading industry executives and experts, including; Algae Producers, Green Energy and Biotech Investors, Biodiesel Manufacturers, Cultivation, Harvesting and Oil Extraction Process Technology Providers, Government Representatives and other Industry Professionals. This event will provide you with excellent opportunities to interact with your peers in constructive and informative round table and panel discussions. During these sessions you can express your views and participate in discussions about current and future industry activity, this will also be one of many chances to have your questions answered by industry professionals, providing you with the answers you want and need. You can listen in on informative and insightful presentations by the leading figures in the algae industry and maximise your contacts and build strong relationships to open up new and exciting business ventures. The CAAFI R&D team is requesting topics for white papers addressing critical research and development barriers. These topics and the papers that will follow will form the basis for a formal CAAFI position on research and investment priorities. Solicit input from the wider R+D team in the form of white papers addressing the gaps and necessary actions to overcome key R+D barriers. Use the R+D team biennial meeting as a workshop venue, where the white paper inputs are a starting point in a robust collaborative process of narrowing down on critical technology gaps and R+D priorities. Produce a CAAFI consensus position on R+D gaps and priorities in order to provide guidance on the most productive focal areas for universities, national labs, state and federal governments to invest in the development of alternative aviation fuels. • What is the barrier? • What is the basis/background that makes this a high R+D priority? • Explain the solvability of the barrier by giving direction for R&D investment/effort. The Alfa-Bird consortium has submitted several ideas of topics. The compilation of these ideas is available here. From submitted topics, a selection will be made by mid-May of the top five to eight research and development areas needing increased attention. CAAFI members who suggested those areas will be asked to prepare a short white paper by August 1,2012 (length and content guidelines forthcoming). After white papers are prepared, submitted and reviewed, they will form the basis for discussion at the bi-annual CAAFI R+D team meeting to be held in Q4 2012 (date and location TBD), with the intent to synthesize input and feedback into the official position paper that is produced by this process. This position paper is intended to provide guidance on the most productive focal areas for universities, national labs, state and federal governments to invest in the development of alternative aviation fuels. Example 1: Fuel producers need less expensive/longer-lasting catalysts. Catalysts are currently a significant cost component for final fuel due to expense, short lifespan, and easy poisoning. This could be solved with new materials research or reaction condition optimization. Example 2: Currently the collection and densification of biomass is energy and emissions intensive and potentially too capital intensive for distributed implementation. Modern agriculture has developed methods for automated collection of agricultural products that are not necessarily compatible with bioenergy crop needs, particularly the removal of water. This could be solved with effective low energy water removal techniques and low environmental-impact collection techniques. Example 3: Development of testing methods (e.g., for ASTM) for oxygenates. A lack of oxygen is an important characteristic of aviation fuels, but the existing testing method is extremely expensive and very few places do it. Focused R&D efforts on new testing methods, or cost reduction of the existing method is critical for the success of drop in aviation fuels. The Aviation Biofuels Webinar to hear from FAA, ASTM and British Airways on the latest developments in Aviation Biofuels: What impact will revised approval processes have on future feedstock pathways? took place on February 29th, 2012. The 60 minute information-driven prelude to the 2-day Aviation Biofuels Conference in Rotterdam next week featured presentations from the FAA, the ASTM and British Airways. The webinar was an informative and thought-leading introduction to aviation approval processes with regards to future feedstock pathways, and included an exclusive insight into how they affect the end-users. The full recording is now available to view - please click here. CAAFI has updated the caafi.org "Fuel Readiness Tools" page. The Commercial Aviation Alternative Fuels Initiative® (CAAFI®) announced that they have updated the caafi.org "Fuel Readiness Tools" page (http://www.caafi.org/information/fuelreadinesslevel.html). This one-stop fuel readiness page aims at facilitating the use and cross referencing of these tools. The page now includes the "Path to Alternative Jet Fuel Readiness" document, the Fuel Readiness Level (FRL) scale, the FRL Exit Criteria (a checklist for requirements to move from one step to the next) and the Feedstock Readiness Level (developed through collaboration with USDA). The “Path to Alternative Jet Fuel Readiness” briefing document was developed by the CAAFI R&D Team to outline the process of fuel development, qualification and certification and the role of CAAFI in facilitating the process. It is intended for use by individuals and organizations interested in producing alternative fuels. The “Path to Fuel Readiness” document provides information on how to become involved with the aviation community, the testing and environmental evaluations required to show the fuel’s suitability for aviation use, and how to best facilitate ASTM International certification for a new fuel. formally accepted and approved by the European Commission (with less than 0.05 % adjustment needed!). The 2011 CAAFI General Meeting will take place at the Georgetown University Hotel and Conference Center in Washington, DC on November 30 and December 1, 2011. The CAAFI General Meeting is the meeting place where alternative aviation fuel professionals from throughout the world gather to discuss, and solve, the challenges they face, and map the future of this new dynamic industry. The “by-invitation-only” CAAFI Conference format includes high-level keynote addresses from government and industry leaders, panel presentations, large and small group discussions, break-out sessions, and a series of networking events. This year’s CAAFI General Meeting has two component parts: A ‘by-invitation-only” Conference for alternative aviation professionals, and an Expo that will introduce the industry to a larger audience. The Expo is located immediately adjacent to the conference room, providing a way for fuel producers and others in the industry to showcase the products they offer and the approaches they are taking. For the 2011 meeting, conference participation for two full days, including refreshment breaks, lunches, and our traditional evening networking reception, is priced at $350 per delegate. Click here to link to the electronic registration form. The draft agenda can be found at www.caafimeeting.com under the “CAAFI Conference” tab at the top of the page. SWAFEA workpackage reports have been published. Resource efficiency is a policy priority for Europe. However, across the region there are many different approaches to ‘doing more with less’, as shown by a survey of countries’ policies, carried out by the European Environment Agency (EEA). In coming years, societies will have to confront a huge challenge. While global population and economic production continue to grow, the resources supporting this upward spiral are finite. The United Nations (UN) recently noted that resource use will triple by 2050 if humans continue to use resources with the same degree of efficiency as we do currently. The European Commission’s recent Resource Efficiency Roadmap states that while “demand for food, feed and fibre may increase by 70 % by 2050, 60 % of the world’s major ecosystems that help produce these resources have already been degraded or are used unsustainably.” Such unchecked resource use will increase environmental destruction and inequality; and ultimately lead to the disappearance of the natural and mineral resources which support modern societies. To address this problem, countries across Europe have been working on strategies and policies to become more resource-efficient. When responding to the survey, countries cited several reasons for attempting to become more resource efficient, including concerns about environmental degradation, economic reasons or shortages of a critical resource such as water. We are proud to inform that the International Organization for Standardization (ISO) has officially confirmed the liaison between ISO/PC 262 (Project Committee: Risk Management) and EU-VRi. 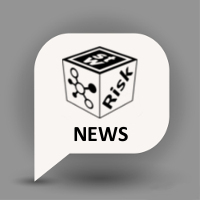 The International Organization for Standardization (ISO) has officially confirmed the liaison between ISO/PC 262 (Project Committee: Risk Management) and EU-VRi. The ISO/PC 262 members, comprising 31 participating countries and 6 observing countries, have kindly accepted the liaison application of EU-VRi. EU-VRi and its members are looking forward to a fruitful collaboration and exchange on standardization activities in the field of ISO 31000 family of standards, and ISO 31004 in particular. Find out more about ISO/PC 262 by following this link. The European Commission, Airbus, leading European airlines and European biofuel producers, have launched an exciting new industry wide initiative to try and speed up the commercialisation of aviation biofuels in Europe. The inititive labelled “Biofuel Flightpath” is a roadmap with clear milestones which targets an annual production of two million tonnes of sustainably produced biofuel for aviation by 2020. The biofuel will be produced in Europe from European sourced feedstock material and has the backing of The European Commissioner, Günther Oettinger, Airbus CEO Tom Enders, major European airlines, and a number of advanced biofuel producers. In July 2008, the ALFA-BIRD (Alternative fuels and biofuels in aviation) program was started. Its main purpose is to develop an ambitious programme on renewable alternative fuels for aviation. The main results obtained so far will be presented in a note. 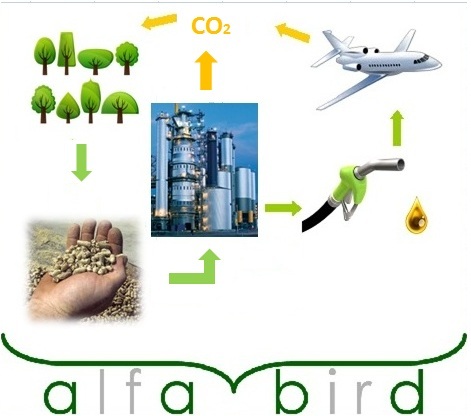 In July 2008, the ALFA-BIRD (Alternative fuels and biofuels in aviation) program was started. Its main purpose is to develop an ambitious programme on renewable alternative fuels for aviation. The main results obtained so far will be presented. The fuel selection process – a two steps procedure - is completed, following the protocol agreed in the ALFA_BIRD proposal. The consortium has completed the second step, which consisted in selecting the 3-4 most promising blends of the fuel mixtures considered. This selection is based on the results of tests on the pre-selection of 12 blends (FSJF, FT-SPK, blends of FT-SPK with naphthenic cut or with hexanol or with furane or with FAE, in different amounts). (iv) a blend of FT-SPK and 20% hexanol. This fuel matrix offers the possibility to evaluate the potential of different chemical families which are paraffinic compounds, naphthenic compounds, and oxygenated compounds. This is also representative with respect to a short, middle, and long term view of possible alternative fuels. In the same time, the Alfa-Bird project started the subproject SP3 – Technical analysis and future alternative fuels strategy. The partners are currently defining the methodologies which will be used for the environmental and economical evaluations. The full note is available here. ELOBIO project has published several report on biofuel. The Elobio project (effective and low-disturbing biofuel policies) is finished. The Elobio's objective was to introduce efficient and low-disturbing policy options that enhance biofuels while minimizing the impacts on e.g. food and feed markets and biomass for power and heat. Elobio has published several reports on biofuel. These reports are available here. Alfa-Bird, through the Workpackage 1.4 (LISBP, CNRS, Lesaffre), submitted an article to the Metabolic Engineering Journal. The oleaginous yeast Y. lipolytica is one of the most extensively studied “nonconventional” yeast. Y. lipolytica is able to accumulate lipids up to 38% of its dry weight. Factors involved into lipid and particularly triglycerides accumulation are not well identified. Using different mutants of glycerol-3-phosphate (G3P) shuttle (∆gut2 or overexpression of GPD1), we were able to modulate G3P concentration and to show that increase of G3P concentration leads to higher TAG accumulation. Our results indicate that increase of G3P accumulation is associated to a decrease of glycerol concentration, suggesting that Y. lipolytica does not possess glycerol-3-phosphatase enzyme. Analysis of genes involved into glycerol metabolism, let us think that Y. lipolytica presents a modified and original glycerol metabolism, which could contribute to the oleaginous character. Moreover, coupling G3P shuttle disorders and deficiency in β-oxidation increase TAG accumulation and by the way lipid accumulation in Y. lipolytica. Finally we obtained strains accumulating up to 65-75% of lipid (W/W dry). By quantitative PCR we were able to show that this is not only link to higher G3P concentration or inability to degrade lipids but it is link to overexpression of genes involved into TAG synthesis (SCT1 and DGA1) and to repression of genes involved into degradation of TAG (TGL3 and TGL4). Alfa-Bird, through INRA, presented a poster during the LMO 09 (Levures, Modèles et Outils IX) in Strasbourg (France) on August 30-31 and 1-2 September 2010. The third workshop and the third General Assembly took place in DLR's premises in Stuttgart. The 2nd Internal Workshop and the 2nd Alfa-Bird General Assembly took place in Toulouse on 6-8 July, 2010. Around 40 participants have attended three days Workshop. On these three days partners have presented progress on their tasks and the main results. Presentations from the Internal Workshop, Open workshop and General Assembly are available on the website. To download the presentations click here. Alfa-Bird, through the Workpackage 1.2 (IFP, DLR, SHELL, SASOL), submitted an article to the IASH Newsletter (The International Association for Stability, Handling and Use of Liquid Fuels). To download the final article, click here. The 18th European Biomass Conference & Exhibition took place in Lyon (France) on 3-7 May. During this event, Marina Braun-Unkhoff (DLR) gave an overview on the possible use of alternative aviation fuels, and mentioned the work in Alfa-Bird. She concluded that for alternative jet fuels, algae, waste, and ligno-cellulosic biomass are the most important fuels to be researched at the moment. You can read the full bulletin dated May 7, 2010 and find here the other daily bulletins. The congress of World Biofuels Market 2010 took place in Amsterdam on 15-17 March. To access at the presentations of the congress "World Biofuels Market 2010" took place in Amsterdam on 15-17 March, click here. Alfa-Bird has reached an important milestone with the selection of 4 alternative fuels for the tests which will be performed during the second phase of the project. To download the note justifying the choice of the 4 alternative fuels, click here. Special Issue on "Combustion Dynamics and Heat Transfer for Alternative Fuels in Gas Turbines," which will be published in the journal "Advances in Mechanical Engineering" in May 2010. Special Issue on "Combustion Dynamics and Heat Transfer for Alternative Fuels in Gas Turbines," which will be published in the journal "Advances in Mechanical Engineering" in May 2010. You can find the Call for Papers for this Special Issue at http://www.hindawi.com/journals/ame/si/cdht.html and the deadline for submission is November 1st, 2009. For more information on Alfa-Bird project you can download the leaflet and the slides. The leaflet and slides presents the main partners of the project, as well as the basic idea, objectives, structure and its planned achievements. Both documents are in pdf format.